Our third stop on our Adventureweiner Oregon Bike Tour was Cannon Beach. We heard this was one of the most dog friendly towns in Oregon so we were excited to check it out. When we literally rolled into Cannon Beach the first thing we did was grab a camp spot at the quaint, family-owned Wright’s for Camping just off the highway. 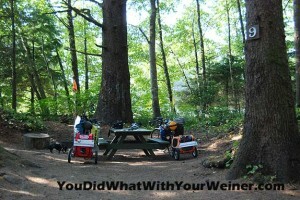 This campground is nice because it is close to town and about 5 blocks from the beach. It has showers, laundry and camp fire wood on site. You won’t find any spaces for RVs here but you will find about 20 semi-wooded campsites with the standard picnic tables and fire pits. I walked into the “office” to check in and was shocked at how small it was. No one was in there so I started to walk out. As I did, I heard a voice call out to me from seemingly above. After following the voice to a tiny box near the entry I turned around to see an old lady in the house up the hill talking to me on a walkie-talkie. She descended the 50 some odd stairs to personally show us around to all of the campsites and check us in. After we set up camp we walked into town (which at 20 minutes was a little longer than we expected) and ate dinner on the patio at the Grill and Scoop. I loved their stone deck looking out onto Main Street but they only had one bathroom stall for women (which meant you often had to wait) and the food was average. We walked down to the beach and headed toward Haystack Rock to catch photos of this famous landmark at sunset. There were about 30 people down there with the same idea. When we looked for a way back up off the beach it seemed that most of the stairs cases were private and were gated to block you from using them. We did manage to finally find a public staircase by the lifeguard station and walked back to camp. We slept in the next day and missed out on a real breakfast. Apparently there is only place, the Pig and Pancake, that serves breakfast late and dogs are not welcome there. We settled for brunch at the Grill and Scoop before we set out to ride into Ecola State Park. After a steep, windy and shoulder-less ride, we arrived at the meadow at the top at hiked out to the lookout. We spent some time taking in the amazing views and then hiked over the bluff to Indian Beach. Unfortunately, we got only one hazy peak through the fog at the famous Tillamook Head Lighthouse while we were there. 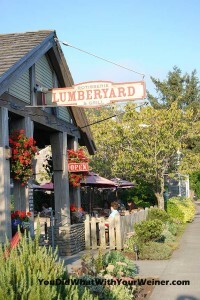 We ate dinner at the Lumberyard Rotisserie and Grill. I had seen photos of this place in one of Go Pet Friendly’s blog posts and thought it looked great so I was super excited to eat here. Apparently the Fish and Chips is to die for because one lady flat out told us that and it seemed everyone around us ordered it. We didn’t. I got the Signature Rotisserie Chicken and it was absolutely delicious! The wait staff was friendly and offered to bring us a bowl of water for the dogs. The other great thing was that they had heat lamps on the patio – which we appreciated since we were a little chilly from wearing damp, sweaty clothes. The next morning we packed up our bikes and stopped in town one last time before we started our 30-mile ride back to Astoria. I am not really a coffee drinker but I insisted (not that I had to twist S’s arm or anything) at Monk’s Coffee. They roast their coffee right there in Cannon Beach and I heard they were not too be missed. Being from the coffee elite Seattle we weren’t super impressed. The coffee was pretty good though and fact that I drank it while riding my bike through down made it way cooler. We ate brunch at Sweet Basil’s Café and, after checking the back roads route back to Astoria at Mike’s Bike shop, we were on our way. Here is the dog-friendly stuff we found to do in Cannon Beach during our visit. Beach – stroll down to the famous Haystack Rock. Tillamook Rock Lighthouse – visible from Tillamook Head (in Ecola State Park) and from north Cannon Beach. 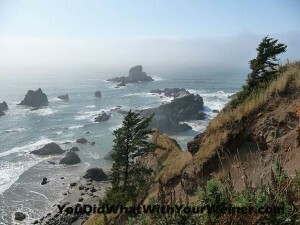 You can’t see it when it is foggy….which is a lot because it is the Oregon coast. Everywhere we looked there were dogs. With several dog-friendly accommodations, 10 Dog-friendly restaurants and summer doggie show this small town ranks among one of the dog-friendliest towns we have visited. I really enjoyed our stay here and look forward to going back some day to check out more of the restaurants and hike on the beach again. 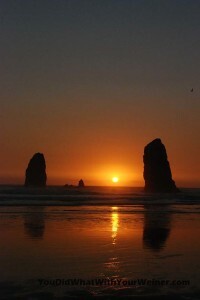 Have you been to Cannon Beach? What were some of your favorite things to do with your dog there? We love Cannon Beach, but haven’t taken the dogs there yet. It’s definitely a fun place to go! Have you checked out the beaches north of Seaside? No, when we were there we were on bikes pulling dogs in a trailer. We only had 4 days to get from Astoria to Cannon Beach and back so our stops were only at Astoria, Seaside and Cannon Beach. How cool! Sounds like you had a great time! I found you on the Pet Blog Hop. I love Cannon Beach. Last time I was there was in July. My dog didn’t get to come. He had to stay home in Arizona, but we brought my brother’s dog. It’s so much fun walking down the beach and wading through the waves with a dog. I’m so glad you enjoyed Cannon Beach! We also had a great time when we were there – Ecola was gorgeous and the pet friendly beaches can’t be beat. Thanks also for the link! It sounds like you had a lot of fun! And very good information for biking with dogs! Yeah, we heard that the lighthouse is fogged in more often than not. That’s ok though, we didn’t even know it was there when we went. You guys get to go on amazing adventures!! That Sunset looks so cool!! I haven’t been to Cannon Beach, but it sure looks like somewhere we should try to get to!! Cannon beach sounds great! It’s a bit far for us, but the forest of dean in the UK is a brilliant place to take your dog on holiday! Looks like you guys had a fun time!! I wish we had a beach near us ..
It’s our favorite dog park. 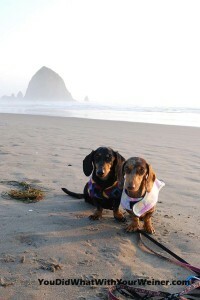 I just love the photo of the weenies on the beach together! Stunning! My husband and I took are doxie Maggie to Cannon Beach last fall for 5 days and we loved it. She had the best time at the beach! She went with us most places, although some of the better restaurants we ate at were without Maggie. I’m sure she was so tired from romping down the beach, she never noticed when we were gone. I loved the story of your whole trip. You are brave!! Or dumb. Ha, ha. Glad you had a good time with Maggie in Cannon Beach.